The sister magazine to Ray Palmer’s incarnation of Amazing Stories was initially “bedsheet” size; this is one of the earliest issues. Features “The Prince of Mars Returns” by Phil Nowlan, who created the character that became known as Buck Rogers. 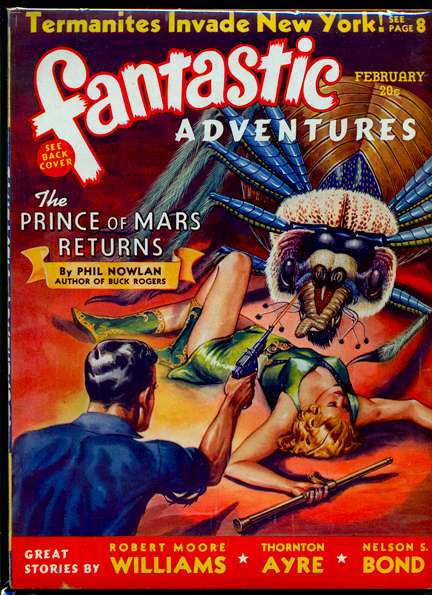 Classic cover has leggy lady being menaced by a giant spider. Painted by Robert Fuqua. Condition: Very Fine, maybe Very Fine minus. Only the most minute traces of use, small nick on bottom of front cover, and a slightly yellow text block, otherwise just about the nicest copy you could ever hope to find.